Dr. Marpu believes the best treatment available in modern medicine is prevention. Dr. Neelima Reddy Marpu is a Board Certified Family Physician and a Member of the American Board of Family Medicine. She is licensed by both the Commonwealth of Virginia Board of Medicine and the State of Maryland Board of Physicians. Dr. Marpu is a member of the American Academy of Family Physicians, the American Medical Association, and speaks varying languages including Hindi and Telugu. Raised in Hyderabad, India Dr. Marpu earned her medical degree at Maharashtra Institue of Medical Science and Research and completed her residency at Forest Park Hospital, St Louis MO. 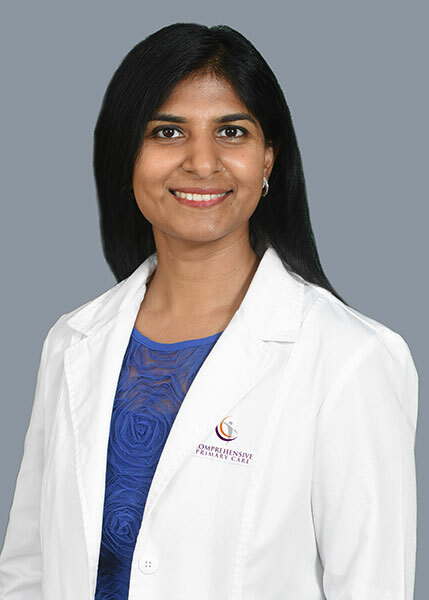 Prior to joining Comprehensive Primary Care Dr. Marpu was the urgent care attending physician at Inova Urgent Care in Centerville, VA.
An advocate for her patients, Dr. Marpu loves to interact with each individual, understand his or her needs, and address concerns accordingly. She practices evidence based medicine, and has special interest in Preventative Medicine and Woman’s Health. In her spare time, you can find Dr. Marpu enjoying a quiet evening in her backyard, taking long walks and spending time with her family. She resides in Ashburn, VA with her husband and her 2 girls.